By choosing a house with WMS Underfloor Heating installed you will be enjoying a warm and cosy home for years to come. Your underfloor heating pipe comes with a 75 year warranty, giving you full peace of mind and confidence in your system for the future. Underfloor heating works by circulating warm water through a series of continuous loops that are fitted underneath your floor creating a large radiant surface that heats your room from the floor upwards. This radiant form of heating is much more comfortable than the convected heat provided by radiators which draws cold air across the floor before heating it and then convects the warm air upwards towards the ceiling. Using a programmable thermostat means you can set your desired temperature for any time of the day or night and the heating will automatically adjust in line with your instructions to the thermostat. UFH is more popular and more accessible than ever before. This growing market trend is a direct result of the following benefits. Life Expectancy: UFH is expected to outlive the life of the building with a 75 year warranty on the pipework. Running costs: UFH is proved to be between 15 - 40 % cheaper to run (v radiators) as it covers a greater surface area, it can therefore run at lower temperatures (50*C rather than 80*C), which makes it efficient. Maintenance: UFH requires very little maintenance. It does not need to be checked for air in the system or bled. Interior Design: With UFH being concealed there is freedom of design to configure furniture. Safety: There are no hot surfaces or hard edges with UFH, providing a safe environment for young children and the vulnerable. Health Benefits and Cleaner Homes: In the UK each day on average 1 in 8 people in the UK are currently being treated for asthma. Underfloor heating is one of the many ways helping to reduce these figures. 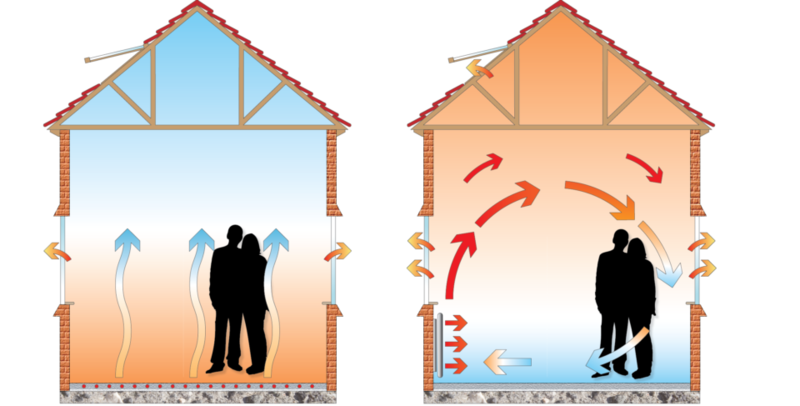 UFH uses radiant heat, unlike radiators or AirCon (convection heat), this reduces the movement of dust (and dust mites!) making it a far more comfortable environment for asthma suffers. Less dust movement also leads to cleaner homes! Sale of Dwelling: UFH has become more expected in homes worth over £300k and is considered a valuable feature, thus estate agents will normally list it on the highlights of the particulars. Floor Finishes: Tiles and stone can get very cold. Radiators only heat upwards from where they are installed so the floor is cold and uncomfortable. With underfloor heating the whole floor essentially becomes one big radiator meaning the floor finish can get warm. 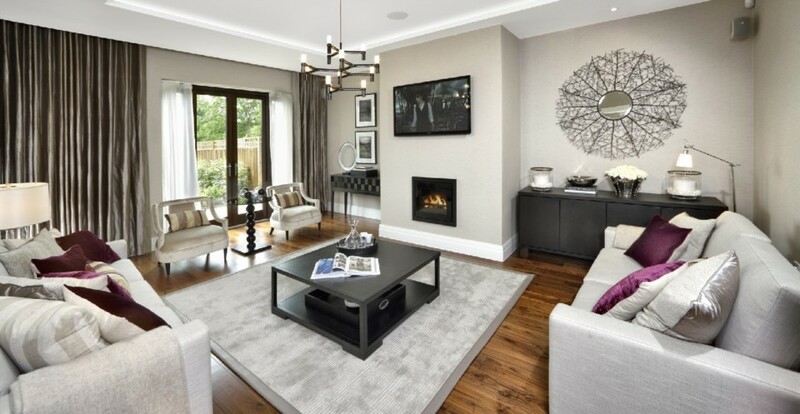 The Carpet Foundation carried out research with the Underfloor Heating Manufacturers Association and proved conclusively that carpet can be used over underfloor heating without impairing the performance of the system. This showed that a carpet/underlay with a combined thermal resistance of less than 2.5 togs allows underfloor systems to operate efficiently. We recommend turning your system on once during the summer months so it is not dormant for long periods. Just 10 minutes will be fine. Be conversant with your thermostats and how your system is controlled. Setting up your comfort settings correctly will maximise efficiencies. Check the water in the system is clean. You will be able to observe the colour of the water in the flow meters on the top of the manifold – if this has discoloured to the extent that the red meter is no longer visible, we recommend you contact your plumber to clean the water in the system. Rugs and similar temporary floor coverings are not recommended, they will trap heat beneath them and make the system work harder to heat the room. Any temporary coverings are especially NOT recommended over sensitive floors (ie. Timber) for risk of overheat and damage. The system can take quite a long time to heat up from cold. This operation should only happen once or twice a year when moving from summer to winter, however this length of time is to be expected. This will not affect on-going use unless the system is turned off to go cold before reheating. Check the system is holding pressure. This can be seen from the pressure gauge on the boiler or the manifold. If the pressure has dropped below 1 bar, top up the system. If it is repeatedly dropping then contact your plumber to discuss this further. WHICH FLOOR COVERINGS SHOULD I USE? A commonly asked question is ‘What floor covering can I put on top?’. The short answer is that most finishes can be used with UFH, but a few consideration need to be taken into account in order to ensure that your chosen floor covering does not adversely affect the output of your UFH system. In general terms, harder surfaces such as stone and ceramic are best for use with UFH as they have the lowest thermal resistance, providing the best heat output; in contrast to coverings like deep-pile carpets and rugs which have the opposite effect. All floor coverings have a ‘tog’ rating, a measure of resistance – which should not ideally exceed 2.5 tog (including any underlays) when used in conjunction with UFH. 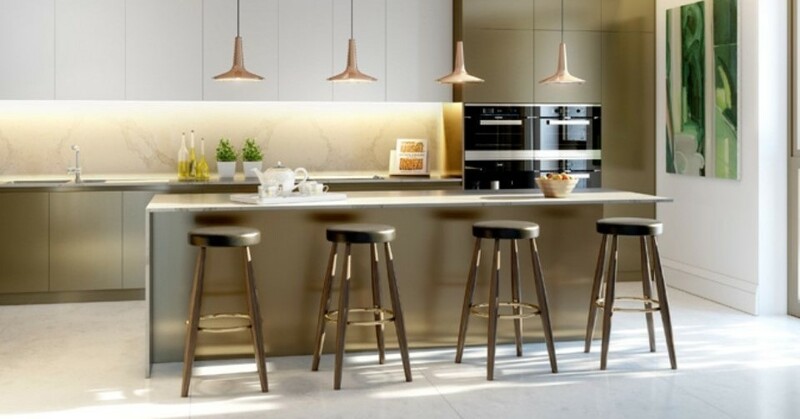 CERAMICS AND NATURAL STONE: These are the best kind of floor covering for use with UFH – due to the density of the material, the thermal resistance is low, allowing the heat from the pipework to travel quickly through and heat the space above. All stone products can be fitted above UFH including natural products such as slate and limestone. WOOD FLOORING: Care must be taken when using wood flooring over UFH, because it is a natural product and therefore can react to changes in the environment in which it is laid. It is essential to check with the flooring manufacturer whether their products are subject to a temperature limit; if this is the case, a floor probe is supplied to limit the heating output to this level. Typically speaking engineered wood floor is the most robust and least likely to react adversely to the heat. Solid wood floors contain a higher content of natural product, and therefore will tend to be more sensitive to heat changes. CARPETS: There is a common misconception that carpet cannot be used with UFH, which is not true, although it is one of the highest-resistance floor coverings, so this must be taken into account. We recommend not exceeding a combined resistance of 2.5 tog for the carpet and underlay, using an underlay specifically designed for UFH is best, to keep the thermal resistance down as low as possible. LAMINATES AND VINYL: Most laminate and vinyl flooring is fine for use with UFH as the coverings are typically thin and high-density, so have a relatively low thermal resistance. We would always recommend checking with the given flooring manufacturer first that the product is suitable for UFH. RUGS: In general terms, rugs are not recommended for use with UFH, not only do they act as an additional resistance for the heat to get through, but heat can also gather beneath the rug, causing potential temperature build-up to a level which could damage the floor covering beneath them. What is night setback? A thermostat with the night setback function will follow the temperature set by the dial during the period that it is programmed to be on, and then automatically reduce the temperature by 4°C when the thermostat is set to be off. How does this affect my room temperatures? The below shows the temperatures that a room will be set to, when using a time clock linked to a room thermostat. Time Clock Mode = On. Set Temperature = 21. Temperature Setback By = 0. Target Room Temperature = 21. Time Clock Mode = Off. Set Temperature = 21. Temperature Setback By = 4. Target Room Temperature = 17. This shows that when the time clock mode is set to ‘ON’, the thermostat will call for heat to get the room to 21°C, as per the thermostat dial setting. However, when the time clock mode is set to ‘OFF’, the thermostat will call for enough heat to get the room to 17°C, which is 4°C lower than the set temperature. Why does this happen? Standard thermostats without night setback are either on or off according to the time clock controlling the system. Conversely, thermostats with the setback function will follow the temperature set on the dial during the ‘timer on’ period, and will automatically reduce their set temperature by 4°C when the time clock is set to be off. This essentially means that, even though the time clock display says that the system is off, it is in effect set at 17°C, and will therefore call for heat if the room temperature drops below this. Why is night setback needed? Night setback protects underfloor heating systems from frost and helps to keep temperatures consistent, although these are not its principal duties. The main advantages are that it helps to improve the energy efficiency of the heating system and improves the response time, which is the time taken to heat the area. The response time of underfloor heating systems is dependent on the amount of heat energy stored in the floor. For that reason, if the room is kept at 3-4°C below the normal set temperature, the time taken to heat up to the set temperature is reduced substantially. How do I increase / decrease the floor sensor? Floor sensors are used for two reasons: a) to protect sensitive floor finishes from overheat, and b) to control the floor temperature in wet rooms where the thermostat is installed outside of the room. Where used to protect sensitive floor finishes, we strongly recommend you do not adjust this yourself – please contact the supplier to ensure this is carried out correctly. When used in wet rooms, the thermostat will need to be configured to read the floor sensor as the primary form of temperature control, then simply increase / decrease the temperature set point to achieve your comfort settings. How do I ensure the flow temperature is correct, that enough heat is being provided by the boiler? Before checking this, ensure a thermostat has been calling for heat for at least 30mins. If the boiler is functioning correctly, hot water will be supplied to the manifold and the manifold bar will be warm (possibly hot) to touch. If there is no heat at the manifold, the boiler is not providing hot water. Please consult your plumbing engineer. My UFH isn’t working? There is a misconception that the floor finish should be very warm to touch when the UFH is operating – please be aware that this is not the case. Due to the size of the surface area of the floor, the floor temperature will only be slightly warmer than the air temperature to be able to achieve your comfort settings. If in doubt, please check your thermostat settings are correctly set up. As a physical test, turn up a thermostat so that it is calling for heat, within 30mins you will be able observe water flowing through the manifold flow meters (on the top of the manifold) and feel warmth coming through from the boiler. If neither of these happen within 1hr, please call us to carry out some simple checks over the phone. Pumpset codes, what different codes and lights mean? When the pump is running, LED 1 is green. The four yellow LEDs indicate the current power consumption (1 = low, 2 = medium low, 3 = medium high, 4 = high). When LED 1 is flashing green the pump is on standby. If LED 1 is red, the pump has detected an alarm. Please contact us to identify the issue. Do you offer a maintenance agreement? Due to the nature of underfloor heating being a concealed product, not prone to corrosion and with minimal moving parts, maintenance contracts are not normally necessary. In the first instance we suggest you call us if you have a question and we will be glad to help. Most issues can be simply resolved over the phone.